Hitting our stride here for summer goodness – sweet corn and sugar snap peas are coming next week. We have a surplus of green beans – let us know if you want extras for next week at $3/lb for canning, freezing or pickling. You can do some amazing things with basil – tomatoes for everyone during the next month. We are switching shares out with bell and hotter peppers. We are about 2 inches below normal rainfall for the month of July and have been irrigating around the clock all week. Roast green beans with olive oil, Kosher salt, and pepper until they start to brown. Dill goes well with those cucumbers for full shares. We have a new cucumber called Striped Armenian (or painted serpent) – it is fun and tasty. We hope you are enjoying the produce so far! Make sure to wash everything before you eat it. There are quite a few things that need to come together between the buying of good seed and the delivering of decent produce to you in the box. One important aspect that we do not talk about much is the irrigation of crops out in the field. We have been diligently doing this for the past few weeks, since we were a couple inches shy of our usual July average for rainfall. 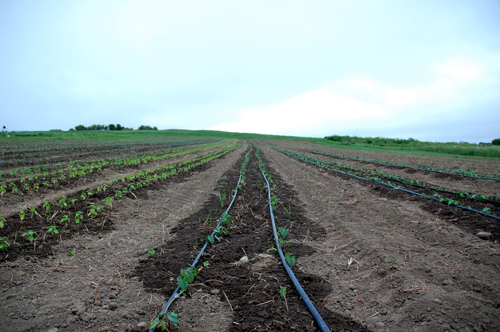 We use drip irrigation from well water here on the farm. We need a pressure tank and pump to reach most of our fields up the hill from our place. Drip irrigation, as we implement it, was first used in Israel in 1959 (https://en.wikipedia.org/wiki/Drip_irrigation). It works well in our situation because it distributes water directly to the roots of the crops with minimal evaporation or watering of weeds outside the row. The plastic tape comes in varying mm thickness and with perforated water emitters at 8, 12, or 16 inches apart. 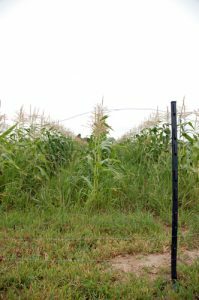 Newly planted seeds, transplanted starts, and shallow rooted crops need irrigation more frequently when Mother Nature does not supply it. 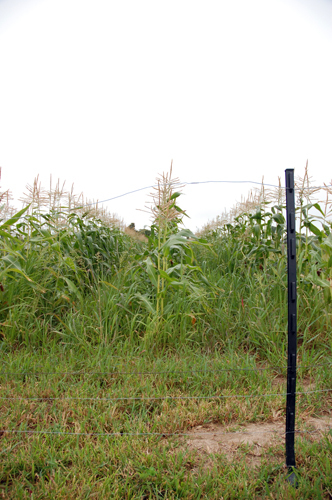 It takes a fair amount of time to move drip line around to the needed crops during the dry times of the season. Some years we hardly have to irrigate at all. We were hoping for a shot of rain last night, but seem to have missed out once again – hopefully the Sunday/Monday system will pan out … but until then we irrigate! The term ‘green bean’ refers to the unripe (and thus still green) fruit and protective pods of any of over 130 varieties of common bean. These beans come in two main forms: climbing, or ‘pole,’ varieties that produce a twisted vine commonly supported by poles; and bush, or ‘dwarf,’ varieties that grow to be only about two feet tall and don’t need any supports. Here at Earth Dance we have the bush variety, which will all reach maturity and then stop producing within only a couple weeks. Green beans are very popular in the U.S., especially around holiday season, and are a great source of vitamin A and a number of antioxidants. 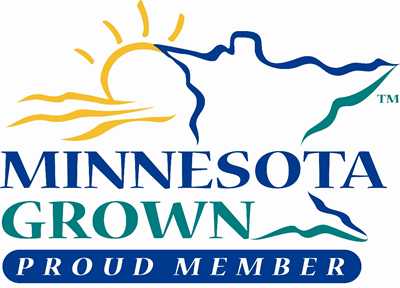 They are great when sautéed or roasted fresh and can be easily canned or frozen to store and eat during the long Minnesota winters. Blanching the beans for a couple minutes before either canning or freezing will help them retain their popular ‘snap’ quality and a pinch of salt will help them retain their flavor. We have plenty of green beans this year so let us know if you would like to buy a couple extra pounds within the next week. Enjoy! Add vegetable oil to a frying pan on medium heat. Once it is hot, add the green beans and let them cook undisturbed for about 1 minute. Mix the garlic, soy sauce, and pepper (and ginger and garlic, if you'd like) in a bowl. When the beans have turned bright green add about 1/4 cup water to the pan. Cook another 2 minutes, until the water is mostly gone. Pour in the sauce and gently coat the beans. Cook for another 2 minutes until most of the liquid is gone. Poke the beans with a fork, if it goes through easily they should be done. Add more soy sauce or pepper if you want it saltier or spicier. This is a great side dish but can be paired with some rice and fried eggs for a quick meal. Place zucchini and squash in a strainer set over a bowl. Sprinkle with 1 Tbsp salt and toss to combine. Let sit 10 minutes then shake in strainer, pressing gently, to remove any excess liquid. Whisk lemon juice, honey, pepper, 1/2 cup basil, 3 Tbsp oil, and 1/4 tsp salt in large bowl. - Heat remaining 2 Tbsp oil in a large skillet over medium heat. Cook the garlic until it begins to sizzle and turn brown (5-7 minutes). With a slotted spoon, transfer the garlic to the bowl with the dressing. Cut remaining tomatoes in half lengthwise and add to bowl with dressing. Add zucchini and squash; gently toss to combine. Add 3 Tbsp olives and 2 Tbsp basil then transfer with tongs to a platter, letting extra liquid drain and remain in bowl. Lay mozzarella on one end of the platter and drizzle with oil. Top the dish with the remaining 2 Tbsp basil and 1 Tbsp olives. Beat the eggs until light and foamy. Add the sugar, oil, zucchini, and vanilla and mix lightly but well. Combine the flour, salt, soda, baking powder, and cinnamon and add to the zucchini mixture. Stir until blended, add nuts, and pour into two 9x5 greased loaf pans.